This week’s talk was a memorable message by sister Linda K. Burton, our recently called general Relief Society president. It goes along so nicely with some of the lessons we have been studying lately in the Doctrine and Covenants about following and acting upon personal revelation. I have felt myself being a little stressed out and maybe snippy lately. Today it dawned on me that maybe I have allowed my life to get too busy and therefore have not left room for things like spontaneous or purposeful service to others. President Hinckley often taught that work/service were a way to get over your own problems, and President Monson has been such a great example of acting upon charitable thoughts and feelings. What are some of your thoughts after studying this talk? How does it affect your goals? Please share your thoughts in the comments below. This talk is such a great reminder of keeping our eyes open to the people around us and acting on the quiet promptings to help them. I know I have benefited from this in my own life so many times. Just yesterday I looked out my kitchen window and saw one of my neighbors shoveling my driveway while I was getting my kids ready for church. He didn’t do it for recognition–he just showed up with shovel and went to work. 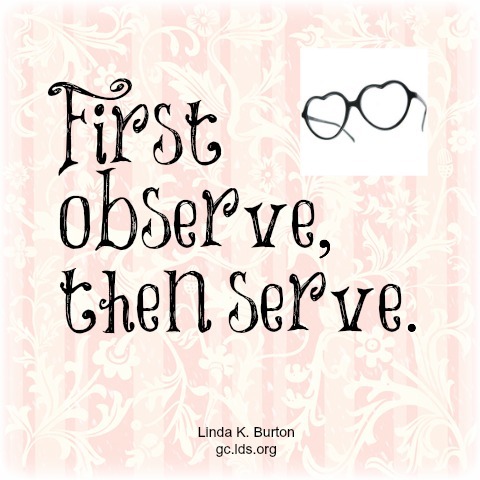 Now I just need to keep my eyes open to see the things I can be doing to serve others too. I’m going to share this for family home evening. I love the examples she gave of people who were observant and then served, and they will inspire us as a family.